Sunday (March 13th) the NY Times released their bestsellers list. Iyanla Vanzant's Broken Pieces: How to Get Through What You're Going Through tops the list. Some of us were speculating (well I was) about the benefit of Iyanla appearing on Orpah's show. I felt she came across more as someone needing help rather than someone who could provide it -- sort of like Steve Harvey on the subject of relationship (I ain't hatin', am I?). 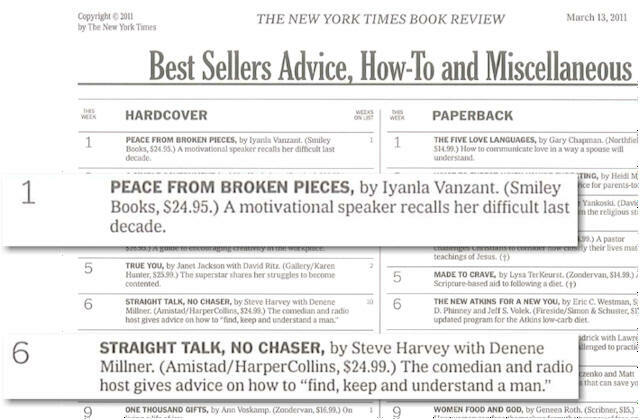 Anyway, Iyanla now has the #1 selling book in the Advice category and I have to believe the Oprah appearance had a lot to do with it. Goes to show how much I know. I also questioned Iyanla Vanzant's expertise after seeing her discombobulated appearance on Oprah's show, and I would agree that this appearance precipitated renewed interest and curiosity about her. Her best-seller sounds like a re-cycling of the same advice she keeps dispensing. She has mastered the art of the "hook". Her catch phrases and cleverly phrased blurbs grab people's interest and make them want to buy her books which, like all self-help books, just find a different way to deliver the same ol advice. IMO. Cynique, I think people derive some "entertainment value" from the problems and tragedies Iyanla has had to content with. That is probably as appealing to some, than the actual advice she dispenses. In regard to her ability to turn a phrase she is right up there with Al Sharpton.